While the market for “Smart Pillows” is expanding (see also the iSense Smart Pillow and the Sunrise Smart Pillow), the ZEEQ Smart Pillow from REM-Fit was one of the first of its kind to appear on the market. The ZEEQ Smart Pillow was actually the result of a successful Kickstarter campaign, and is a highly ambitious concept. While many users of this Smart Pillow report high satisfaction and improved sleep with the device, there are some problems with the technology as it stands. This review will walk you through the pros and cons of the ZEEQ Smart Pillow to help you determine if it can help you to stop snoring and get more quality sleep each night. The major advantage of non-wearable sleep tracking devices is that they provide more comfort and flexibility during sleep while still keeping track of your sleep data. The ZEEQ Smart Pillow is fundamentally a pillow and it is designed to be unnoticed during sleep. Even with all of the gadgetry and battery power in the pillow, it does not seem to overheat or become warm when in use. The design of the Smart Pillow itself is larger than an average pillow. This makes it somewhat difficult to fit into commonly used pillowcases. Usefully, however, the interior of the pillow is filled with several “compartments” of memory foam stuffing. By removing or adding these compartments, you can easily adjust the stuffing level to your satisfaction. Having a too puffy or too thin pillow can interfere with sleep quality which is precisely what a sleep-aid should not do. As such, this feature is extremely useful and is a definite advantage of the ZEEQ Smart Pillow. As with all memory foam pillows, it is important to give the Smart Pillow time to adjust to your body and sleep movements. After it "“"loosens up” over time, it will likely become more comfy. As advertised, the shell of the ZEEQ Smart Pillow is made of Tencel fabric. This sustainable wood-cellulose based fabric is handy for being anti-bacterial and easily washable. Some users report that it is highly comfortable, although some report precisely the opposite. It is likely a matter of choice and comfort as to whether this fabric will suit your preferences. The interior of the pillow also includes several vibration mechanisms, a gyroscope, and speakers. With all of these electronics embedded in the device, one might think that these would be felt while moving around during sleep. Most users report that this is not the case, and the pillow is actually quite comfortable. Setting up the Smart Pillow is relatively straightforward. All that is required is a quick charge of the pillow and the battery life can last from five to fifteen days (and is then rechargeable). It is a commonly-cited useful feature that the Smart Pillow only requires a battery and does not need to continually be plugged in throughout the night. The User Manual is easy to understand and technical support from REM-Fit is easily available. It also includes a remote control to turn it on/off, or increase or decrease volume. There are some issues with connecting the device to the mobile app (which is required to display the analytical output of your sleep data). We will get into this issue down below. One of the big highlights of the ZEEQ Smart Pillow are the built-in wireless speakers. Through a Bluetooth connection, you can easily program the speakers to play anything from your iTunes or Spotify playlists. Along with many other users of this product, I find that listening to light music or even natural ambient sounds can vastly improve my ability to relax and ultimately fall asleep. This feature is incredibly useful. There is an automatic music sleep timer which can turn off the audio after a programmed time to prevent the noise from waking you up. You can also set the speakers to emit a (silent) alarm to gently wake up in the morning. Best of all, the speakers are configured in such a way that they will not disturb your partner from sleeping soundly as well. It might sound too good to be true, but experience suggests that this anti-disturbance feature generally works quite well (within reason). 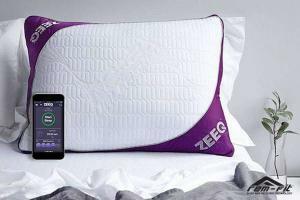 The ZEEQ Smart Pillow has a built-in decibel-tuned microphone to catch any snoring. While the ZEEQ Smart Pillow is advertised primarily as a sleep tracking device, it is also touted as being useful at preventing snoring. In this regard, it seems to be somewhat lacking. The intuition behind the anti-snoring mechanism is clear; that is, the device picks up the sound of snoring in the ambient environment and gently vibrates to shake the user out of a snoring spell. Somewhat problematically, however, at this stage the technology also picks up other sounds and subsequently vibrates in response to these. What this boils down to is a more disrupted sleep which does little to improve your snoring. The vibration settings can be adjusted to be more gentle or more vigorous depending on how much coaxing a user needs to snap out of their snoring. While the possibility of adjustment may help to minimize the unnecessary sleep disruption caused by other non-snoring noises (or perhaps even snoring from your partner… or your pets! ), it cannot be said that this aspect of the pillow is completely foolproof as of yet. By tracking your motion throughout the night (via integrated motion sensors) and the amount of time you sleep, the app determines the user’s “sleep score” for each night. While – in principle – this feature could be extremely useful, it seems to be somewhat arbitrary at this point. Some users report sleeping poorly and waking up tired while still receiving high sleep scores. There is no heart rate monitor, and the algorithm only seems to rely on snoring and motion data to determine the score. Considering this, along with the problematic snore-detection mechanism, it seems that one cannot fully rely on the output provided by the ZEEQ app. It is unlikely that the pillow can detect the difference between someone who is awake and lying very still, and someone who is sound asleep. You are also able to set the pillow to automatic sleep detection or put it in manual mode; however, the latter assumes that the user is asleep as soon as the button is pressed. This can also interfere with taking accurate sleep statistics. If you are buying this product primarily to glean data to gauge your sleep quality over time, it seems that the ZEEQ Smart Pillow may not be ideal for such purposes. The pillow also includes a "Smart Alarm" feature. 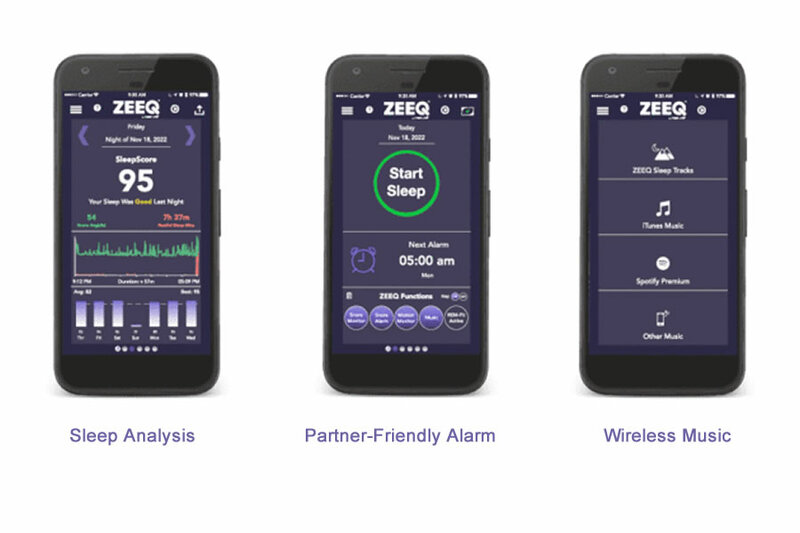 ZEEQ monitors your sleep cycles (light or deep sleep) and detects the best time to wake you up while you are in a light sleep phase. This Smart Wake-up function may be useful for some sleep-hacking enthusiasts. One of the last things you want to do before you sleep is fiddle with controls or settings. In this regard, there are some issues with the Bluetooth connectivity of the ZEEQ Smart Pillow. In some cases, it can take a few tries to ensure that your selected music is being piped through the pillow’s speakers rather than from your phone itself. While this is unlikely to not work altogether, it may deter you from falling asleep immediately and when you want to. Usefully, however, this product can be integrated with smart home technology. This entails a number of possible applications including syncing it with a smart coffee maker (for example). Ultimately, it is worth check the connectivity with Bluetooth before bed to avoid any late-night unpleasantness. The free downloadable app is required to access the analytical output of your sleep data. While the app is user-friendly and intuitive, and it also works with iOS, Android, and Alexa. Conveniently, additional data and analysis can be gleaned by incorporating REM-Fit’s Active 200 Fitness sleep tracker (which can monitor your activity throughout the day). However, the app itself is known to be somewhat buggy and can crash without notice. While it is continually updated, you should consider testing it out before your first trial sleep with the ZEEQ Smart Pillow. You will also want to be sure to set up an account with the system before you plan on heading to bed as this can take some time. Each night, the app also runs the user through a brief survey of their daily activities which revolve around alcohol consumption, exercise, and the like. If you are interested in more advanced analytics of your sleep habits, this could be a useful feature. Otherwise, it might be another unwanted interruption holding you back from your rest. Depending on your sleep sensitivity or your particular sleep tracking needs (and expectations), the ZEEQ Smart Pillow could be for you. With a price tag of nearly $200, however, the cost of entry can be off-putting. The device is an ambitious attempt to include all of these features in one convenient unit; however, in many ways it feels like the current offering is simply a prototype that has a lot of potential to be improved over time. Specifically, some users report that the anti-snore vibration settings are too strong while others consider them too weak. Keep in mind, however, that these settings are adjustable. The speakers are the real highlight here, though. With partner-friendly sound control, they can significantly improve your ability to relax and drift off. If you are unsure as to whether this product could be useful to you, it is worth purchasing if only to try it out. Simply ensure that you can return the product within a specified amount of time if you find that it is not worth the investment. Consider looking at other sleep tracking devices should the ZEEQ Smart Pillow not be your first choice. REM-Fit offers a number of other sleep tracking products, including a Sleep Monitor fabric strap that is actually placed under your mattress. Additionally, they offer a whole line of more affordable Smart Pillows which include one of each of the main features of the Smart Pillow reviewed here (that is, one of the sleep tracker, speakers, or anti-snore features).